Lincoln Park is a little park near the Legion of Honor. It has playground for kids but what's great about this area is how green it is! 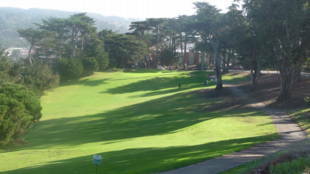 34th Ave leads up the Legion of Honor through the Lincoln Park Golf Course. This massive area is perfect for a romantic stroll or a little exercise. 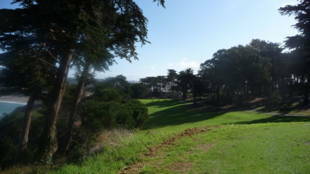 Walk all the way up to the Legion of Honor and be spellbound by the view of the Golden Gate Bridge and its surroundings! While you're there, be sure to visit the Legion of Honor where they always have a wonderful permanent collection of fine art and other special exhibits on display. 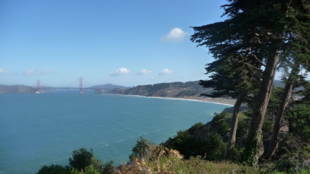 Right next to the museum is Land's End, with awesome scenic cliffs and easy trails just right for beginning hikers. Lincoln Park/ California Palace of the Legion of Honor is owned by the San Francisco Recreation and Park Department. 18-46th Avenue takes you right to the Legion of Honor's doorstep. Open six days a week, Tuesday through Sunday, 9:30 a.m.- 5:15 p.m.
Open July 4 from 9:30 a.m. to 3 p.m.
Closed January 1, Thanksgiving Day, and December 25. Adults $10.00, Seniors 65 and over $7.00, Youth 13-17 $6.00, Children 12 and under FREE. Admission tickets to the Legion may be used on the same day for free entrance to the de Young. First Tuesday of each month FREE. Special exhibition surcharges, if any, still apply. Muni riders with Fast Pass or transfer receive a $2 discount. High on a headland above the Golden Gate -- where the Pacific Ocean spills into San Francisco Bay -- stands the California Palace of the Legion of Honor, the gift of Alma de Bretteville Spreckels to the city of San Francisco. Located in Lincoln Park, this unique art museum is one of the greatest treasures in a city that boasts many riches. The museum's spectacular setting is made even more dramatic by the imposing French neoclassical building. In 1915 Mrs. Spreckels fell in love with the French Pavilion at San Francisco's Panama Pacific International Exposition. This pavilion was a replica of the Palais de la Legion d'Honneur in Paris, one of the distinguished eighteenth-century landmarks on the left bank of the Seine. The H tel de Salm, as it was first called, was designed by Pierre Rousseau in 1782 for the Prince de Salm-Kyrbourg. Completed in 1788, it was not destined to serve long as a royal residence; the German prince, whose fortunes fell with with the French Revolution, lived there only one year. Madame de Sta l owned it briefly before Napoleon took it over in 1804 as the home of his newly established L gion d'Honneur, the order he created as a reward for civil and military merit. Alma Spreckels persuaded her husband, Adolph B. Spreckels, the sugar magnate, to recapture the beauty of the pavilion as a new art museum for San Francisco. At the close of the 1915 exposition, the French government granted them permission to construct a permanent replica, but World War I delayed the groundbreaking for this ambitious project until 1921. Constructed on a remote site known as Land's End--one of the most beautiful settings imaginable for any museum--the California Palace of the Legion of Honor was completed in 1924, and on Armistice Day of that year its doors opened to the public. In keeping with the wishes of the donors, to 'honor the dead while serving the living,' it was accepted by the city of San Francisco as a museum of fine arts dedicated to the memory of the 3,600 California men who had lost their lives on the battlefields of France during World War I. Architect George Applegarth's design for the California Palace of the Legion of Honor was a three-quarter-scale adaptation of the eighteenth-century Parisian original, incorporating the most advanced ideas in museum construction. The walls were twenty-one inches thick, made with hollow tiles to keep temperatures even, and the heating system design eliminated aesthetically offensive radiators and cleansed the air that filtered through it with atomizers to remove dust. Seven thousand cubic yards of concrete and a million pounds of reinforcing bar went into the structure, but an assessment performed in the 1980s showed that the landmark building needed to be made seismically secure. Between March 1992 and 11 November 1995 -- its seventy-first anniversary -- the Legion underwent a major renovation that included seismic strengthening, building systems upgrade, restoration of historic architectural features, and underground expansion that added 35,000 square feet. Visitor services and program facilities increased, without altering the historic facade or adversely affecting the environmental integrity of the site. The architects chosen to accomplish this challenging feat were Edward Larrabee Barnes and Mark Cavagnero. The new Legion realizes a 42 percent increase in square footage, including six new special exhibition galleries set around a skylit court. The graciously transformed museum provides for new and expanded services for both visitors and scholars. On the lower level, the paper conservation laboratory, nationally recognized for its innovative and high quality work, has nearly doubled in size and is now better equipped to serve as a training center for paper conservators, while still providing free monthly clinics to the public. A new print study room allows close examination of works on paper, as well as access to the collection by means of four computerized work stations. Similarly, a new porcelain study room adjacent to the museum's porcelain gallery gives scholars an opportunity to examine this area of the museum's collection. Also on the lower level, a spacious new restaurant provides visitors with a place to eat and relax while enjoying dramatic views of the museum's garden and the Pacific Ocean beyond. Across from the restaurant, an expanded museum store features a wide selection of art posters and books, notecards, jewelry, and other gift items. The funding for this ambitious renovation was supplied by an unusual public and private partnership. Public bonds, approved by San Francisco voters, contributed to the seismic upgrade, asbestos removal, and improved accessibility for disabled visitors. In addition, the National Endowment for the Arts awarded the museum a challenge grant for the project. The remainder of the funding came largely from private donations. Campaign 2000/Phase I, Trustee Improvements to the California Palace of the Legion of Honor, was chaired by Mr. and Mrs. John N. Rosekrans, Jr. John Rosekrans is the grandson of A. B. and Alma Spreckels, the founders of the museum. Alma Spreckels regarded this museum as her mission in life and felt it was her responsibility to bring art within the reach of the public. In addition to providing the building, she formed the museum's early collection, including a group of sculptures by Auguste Rodin -- covering all periods of his career and eventually numbering over eighty pieces in plaster, terracotta, marble, and bronze. Alma was introduced to Rodin by her friend Lo e Fuller, the innovative and influential American dancer who had won the heart of belle poque Paris. Lo e urged Alma to collect Rodin sculpture for her San Francisco museum. Shortly before his death in 1917 Rodin helped his new patron select works from his studio. Alma's early attraction to Rodin's sculpture gave her the opportunity to acquire casts that date almost exclusively from his lifetime. During a period of nearly thirty-five years Alma assembled a collection that is one of the finest outside of France, including an early cast of The Thinker acquired from the artist in 1915. Later that year she purchased from Lo e Fuller a cast of John the Baptist, one of twelve sculptures exhibited by Rodin in the French Pavilion at the Panama Pacific International Exposition. Lo e Fuller was an exponent of 'free dancing.' She appeared on stage in barefeet and a loose silk costume, using wands made of aluminum or bamboo to manipulate the fabric in space. Alma made other significant gifts that set the tone for the Legion of Honor's collection: French furniture, silver, and ceramics; antiquities; and a large group of objects associated with the art of the dance. She initially collected ballet designs as a hobby. Inspired by her friendship with Lo e Fuller, she began to collect dance-related sculpture and drawings, as well as costume and set designs for opera and ballet. Because of her close connections with artistic circles in Paris, she was able to purchase exceptional works, including examples of stage designs for Diaghilev's Ballets Russes by Russian avant-garde artists such as Gontcharova, Larionov, and Bakst. In the late 1950s and early 1960s Alma transferred her collection to the Legion of Honor. Several generous gifts have since augmented her collection. In 1977 Mr. and Mrs. Nikita Lobanov presented the museum with forty costume and set designs by the second generation of Russian stage designers. These and other contributions have made the Theater and Dance Collection at the Legion of Honor one of the foremost repositories of theatrical design in the country. Alma Spreckels also enlisted others to help fill her new museum. The list of her friends and acquaintances who donated works of art reads like a who's who of early-twentieth-century collectors. Among them, Archer M. Huntington (connected by marriage with the Spreckels family) presented the Legion with the major portion of its extremely fine eighteenth-century French art. This collection was largely gathered by his mother, the flamboyant socialite Arabella Huntington, who had spent years in Paris indulging in works of art. She bought well from a number of French and American dealers, eventually creating one of the first serious collections of French decorative arts in the United States. When she died, a choice selection of paintings, sculpture, tapestries, porcelains, and especially fine furniture that had filled her New York mansion was given by her son Archer in memory of his father, Collis P. Huntington, one of the 'Big Four' who built the transcontinental railroad. In 1940, with the acquisition of the Mildred Anna Williams Collection and the establishment of the museum's first substantial endowment fund to ensure its growth, the Legion of Honor was well on the way to becoming a major art museum. Here again, Alma Spreckels played the dominant role. At Alma's urging, her close friends Mildred Anna and Henry K. S. Williams, who lived abroad most of the year, deeded the contents of their large Paris house to the Legion. Seventy art treasures -- paintings, tapestries, and furniture -- were hastily packed for departure on the last steamer to leave Marseilles before the outbreak of World War II. Through the continued interest of Mr. Williams, even after the death of his wife, and the prudent use of his endowment fund, the museum was able to augment the original collection of paintings -- chiefly of the European schools from the sixteenth to the nineteenth century -- with outstanding works of many other European masters. The collection now includes paintings by Le Nain, Cranach, Oudry, Nattier, Vig e Le Brun, Degas, Renoir, Manet, and many others -- more than 130 paintings in all. Other important donations have enriched the museum -- among them, that of Albert Campbell Hooper, who donated about four hundred objects, strengthening the areas of Dutch and Flemish painting of the seventeenth century and English painting of the eighteenth century. The collection of H l ne Irwin Fagan (whose father had been a partner in the sugar business of the Spreckels family) brought to the Legion many of its medieval and Byzantine objects, Franco-Flemish tapestries, and Romanesque and Gothic sculptures. More recently the Bowles Collection of English and French porcelain has added considerably to the museum's ceramics holding. Brought together by the passionate collectors Constance and Henry Bowles, this donation that first began in the 1980s continues to be augmented by additional gifts from Henry Bowles's widow, Constance Peabody, and his brother, George Bowles. In 1948 Mr. and Mrs. Moore S. Achenbach created the Achenbach Foundation for Graphic Arts and presented their entire collection of works on paper to the city of San Francisco. Initially housed in the Main Library, in 1950 the collection was moved to its permanent home in the Legion of Honor. The vast collection of prints and drawings assembled by the Achenbachs became the core of the museum's department of prints and drawings, comprising the largest collection of works of art on paper in the western United States. The collection has been substantially increased through an endowment bequest of the Achenbachs and by generous gifts of other donors. More than eighty thousand works on paper span the period from the end of the fifteenth century to the present time, including early old-master prints and drawings, Japanese prints, Persian and Indian miniatures, nineteenth-century photography, modern and contemporary graphics, and artists' books. In 1991 the Achenbach Foundation for Graphic Arts acquired the Crown Point Press Archive, a body of more than three thousand works of art on paper. This collection, from one of the most important printmaking workshops in the country, includes both published prints and many studies and working proofs that accompany them. In 1970 a joint action of the Trustees of the Legion of Honor and the M. H. de Young Memorial Museum united the two institutions under a single administrative head, carefully merging the two collections. The new institution was named The Fine Arts Museums of San Francisco. The Legion now houses the best of the collections of antiquities and European art from both of these museums, as well as the works of art on paper of the Achenbach Foundation for Graphic Arts. The de Young Museum in Golden Gate Park primarily displays American art of all periods, costumes and ethnographic textiles, and the traditional arts of Africa, Oceania, and the Americas. Among the most important collections to come to the Legion from the de Young Museum is that of Roscoe and Margaret Oakes, a couple who considered the museum to be their second home. Their collection includes paintings representing the great schools of Dutch, Flemish, and British art of the seventeenth, eighteenth, and nineteenth centuries. Among the paintings in the Oakes collection is Gabriel Metsu's Woman Playing the Viola da Gamba, as well as works by Rembrandt, Rubens, Van Dyck, Gainsborough, Reynolds, and Raeburn. The Oakeses also provided a generous fund for art acquisition that continues to enrich the museum through the purchase of masterworks, such as Saint John the Baptist Preaching by Mattia Preti, the plaster sculpture The Orator by Picasso, and an Assyrian wall relief from the palace of Ashurnasirpal II. In 1961 the de Young received a major gift from the Samuel H. Kress Foundation. When the Kress Collection was dispersed to museums throughout the United States, San Francisco received many of the finest paintings by European masters -- Saint Francis Venerating the Crucifix by El Greco and Interior with Mother and Children by Pieter de Hooch -- as well as outstanding works by Salomon van Ruysdael and Giovanni Battista Tiepolo. In the late 1960s the de Young Museum received an unexpected gift of works of art from the collection of T. Edward and Tullah Hanley. With the eye of a connoisseur, Dr. Hanley selected works of exceptional interest by noted European and American artists. A particularly important French work from this collection is Gauguin's L'Arl sienne, Mme Ginoux, a drawing that inspired paintings by both Gauguin and van Gogh. Ancient art was considered a requisite part of any museum in the early twentieth century, and both M. H. de Young and Alma Spreckels sought to furnish their institutions with a variety of objects from times past. The antiquities they brought to their museums, and those that have been added over the years, cover broad geographical and chronological ranges within the ancient Mediterranean world - primarily Egypt, the Near East, Greece, the Aegean Islands, Rome, and Etruria. One of the earliest gifts of ancient art to the Legion of Honor was a group of antiquities received by Alma Spreckels from Elizabeth, the Queen of Greece. Alma Spreckels continued her generous support of the Legion of Honor through the years. In addition to seeing that her museum was filled with treasures, in 1955 she provided the initial funding and encouragement for the museum auxiliary Patrons of Art and Music. 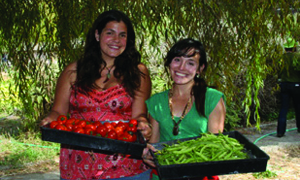 This organization grew to support the ambitious cultural programs that Alma had envisioned for the Legion. When she died in 1968 her legacy was an impressive art museum with a vital future. The other reason to visit are the art workshops. On most Saturdays the museum offers special programs for parents and kids. They're free with museum admission. Kids ages 7-to-12 can attend Doing and Viewing Art, and 3-to-6 year-olds can check into Big Kids, Little Kids. Each week children visit a different museum gallery and then participate in related studio art experiences under the guidance of museum docents and professional artists. Drop-ins are encouraged; no preregistration is required. Call 415.750.3658 for more information.